The first World Cup was the only one without qualification. Every country affiliated with FIFA was invited to compete, and given a deadline of 28 February 1930 to accept. Plenty of interest was shown by nations in the Americas; Argentina, Brazil, Bolivia, Chile, Mexico, Paraguay, Peru and the United States all entered. A total of seven South American teams participated, more than in any subsequent World Cup Finals. However, because of the long and costly trip by ship across the Atlantic Ocean, and the length of absence required for players, very few European teams were inclined to take part. Some refused to countenance travel to South America in any circumstances, and no European entries were received before the February deadline. In an attempt to gain some European participation, the Uruguayan Football Association sent a letter of invitation to The Football Association, even though the British Home Nations (England, Northern Ireland, Scotland and Wales) had resigned from FIFA at the time. This was rejected by the FA Committee on 18 November 1929. Two months before the start of the tournament, no team from Europe had officially entered. FIFA president Jules Rimet intervened, and eventually four European teams made the trip by sea: Belgium, France, Romania, and Yugoslavia. The Romanians, managed by Constantin Rădulescu and coached by their captain Rudolf Wetzer and Octav Luchide, entered the competition following the intervention of newly crowned King Carol II. He selected the squad personally, and negotiated with employers to ensure that the players would still have jobs upon their return. The French entered at the personal intervention of Rimet, but neither France's star defender Manuel Anatol nor the team's regular coach Gaston Barreau could be persuaded to make the trip. The Belgians participated at the instigation of German-Belgian FIFA vice-president Rodolphe Seeldrayers. The Romanians boarded the SS Conte Verde at Genoa, Italy, the French were picked up at Villefranche-sur-Mer, France on 21 June 1930; and the Belgians embarked at Barcelona, Spain. The Conte Verde carried Rimet, the trophy and the three designated European referees: the Belgians Jean Langenus and Henri Christophe, along with Thomas Balway, a Parisian who may have been English. The Brazilian team were picked up when the boat docked in Rio de Janeiro, D.F. on 29 June before arriving in Uruguay on 4 July. Yugoslavia travelled via the mail steamship Florida from Marseille, France. In the Kingdom of Yugoslavia there were doubts about their participation at first. Since the Croatians decided to boycott the national team, King Alexander I did not want to finance the whole idea, but in the end they found a solution. Belgrade, Yugoslavia football association officials decided to round up only domestic (Serbian) star players, mainly from two rival Belgrade clubs, BSK and SK Jugoslavija, with an additional three Serbs who played for French clubs (Ivan Bek among them). Therefore, the Yugoslavia team was exclusively made up of Serbian players; and with the two biggest stars of the team, Blagoje Marjanović ("Moša") and Aleksandar Tirnanić ("Tirke"), both from BSK, they were ready for a trip to South America to represent Yugoslavia in the World Cup. The Yugoslavians were the youngest team in the World Cup; with an average age of 21 years and 258 days. After their first match, against Brazil, they received a new nickname "The Ich-es" or "Ichachos" (in Spanish) by the Uruguayan press; referring to most of the player's surnames that ended up with the "-ić" or "-vić" suffix, which is quite common for Serbian last names. They achieved the joint–biggest success in both Yugoslav and Serbian subsequent World Cup footballing history, by earning fourth place, a result that would be repeated in 1962. Italy, Sweden, the Netherlands, Spain, Hungary and Uruguay all lodged applications to host the event. Uruguay's bid became the clear selection after all the other countries withdrew their bids. All matches took place in Montevideo. Three stadiums were used: Estadio Centenario, Estadio Pocitos, and Estadio Parque Central. The Estadio Centenario was built both for the tournament and as a celebration of the centenary of Uruguayan independence. Designed by Juan Scasso, it was the primary stadium for the tournament, referred to by Rimet as a "temple of football". With a capacity of 90,000, it was the largest football stadium outside the British Isles. The stadium hosted 10 of the 18 matches, including both semi-finals and the final. However, a rushed construction schedule and delays caused by the rainy season meant the Centenario was not ready for use until five days into the tournament. Early matches were played at smaller stadiums usually used by Montevideo football clubs Nacional and Peñarol, the 20,000 capacity Parque Central and the Pocitos. Fifteen referees participated in the tournament: four Europeans – two Belgians (Henri Christophe and John Langenus), a Frenchman, and a Romanian (Constantin Rădulescu, also the Romanian team coach), and eleven from the Americas – among them six Uruguayans. In order to eliminate differences in the application of the Laws of the Game, the referees were invited to one short meeting to iron out the most conflicting issues arising from the game. Of all the refereeing appointments, the two that attracted most attention were that of Gilberto de Almeida Rêgo in the match between Argentina and France, in which the Brazilian referee blew for full-time six minutes early, and that of the Bolivian Ulises Saucedo's in the Argentina and Mexico encounter, which Argentina won 6–3. During the game Saucedo, who was also the coach of Bolivia, awarded three penalties. The following is the list of officials to serve as referees and linesmen. Officials in italics were only employed as linesmen during the tournament. The 13 teams were drawn into four groups, with Group 1 containing four teams, and the others containing three. Each group played a round-robin format, with the four group winners progressing to the knockout semi-final stage. Uruguay, Argentina, Brazil, and the United States were seeded, and were kept apart in the draw, which took place in Montevideo once all the teams arrived. 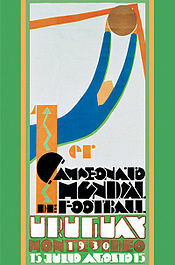 Since there were no qualifying games, the opening two matches of the tournament were the first World Cup games ever played, taking place simultaneously on 13 July 1930; France beat Mexico 4–1 at the Estadio Pocitos, while the United States defeated Belgium 3–0 at the same time at the Estadio Gran Parque Central. France's Lucien Laurent was the scorer of the first World Cup goal. We were playing Mexico and it was snowing, since it was winter in the southern hemisphere. One of my team mates centred the ball and I followed its path carefully, taking it on the volley with my right foot. Everyone was pleased but we didn't all roll around on the ground – nobody realised that history was being made. A quick handshake and we got on with the game. And no bonus either; we were all amateurs in those days, right to the end. The first group was the only one to contain four teams: Argentina, Chile, France and Mexico. Two days after France's victory over Mexico, they faced group favourites Argentina. Injuries hindered France; goalkeeper Alex Thépot had to leave the field after 20 minutes, and Laurent, after a fierce tackle by Luis Monti, spent most of the match limping. However, they held out for most of the match, only succumbing to an 81st-minute goal scored from a Monti free kick. The game featured an officiating controversy when referee Almeida Rêgo erroneously blew the final whistle six minutes early, with Frenchman Marcel Langiller clear on goal; play only resumed after protests from the French players. Although France had played twice in 48 hours, Chile had yet to play their first match. They faced Mexico the following day, gaining a comfortable 3–0 win. France's final match, against Chile, featured the first penalty kick of the World Cup . The first goalkeeper to save a penalty was Alex Thépot of France on 19 July 1930, saving from Chile's Carlos Vidal in the 30th minute of the match. In Argentina's second match, against Mexico, three penalty kicks were awarded. During the same match on 19 July 1930 Mexico's Oscar Bonfiglio Martínez saved another penalty at the 23rd minute of the match against Argentina's Fernando Paternoster. Guillermo Stábile scored a hat-trick in his international debut as Argentina won 6–3, despite the absence of their captain Manuel Ferreira, who had returned to Buenos Aires to take a law exam. Qualification was decided by the group's final match, contested by Argentina and Chile, who had beaten France and Mexico, respectively. The game was marred by a brawl sparked by a foul on Arturo Torres by Monti. Argentina won 3–1 against their neighbours and advanced to the semi-finals. The second group contained Brazil, Bolivia and Yugoslavia. Brazil, the group seeds, were expected to progress, but in the group's opening match, unexpectedly lost 2–1 to Yugoslavia. Going into the tournament Bolivia had never previously won an international match. For their opener they paid tribute to the hosts by wearing shirts each emblazoned with a single letter, spelling "Viva Uruguay" as the team lined up. Both of Bolivia's matches followed a similar pattern, a promising start gradually transforming into heavy defeat. Against Yugoslavia, they held out for an hour before conceding, but were four goals down by the final whistle. Misfortune played its part; several Bolivian goals were disallowed. Against Brazil, when both teams had only pride to play for, the score was 1–0 to Brazil at half-time. Brazil added three more in the second half, two of them scored by the multi-sportsman Preguinho. Yugoslavia qualified for the semi-finals. Hosts Uruguay were in a group with Peru and Romania. The opening match in this group saw the first player expulsion in the competition, when Plácido Galindo of Peru was dismissed against Romania. The Romanians made their man advantage pay; their 3–1 win included two late goals. This match had the smallest crowd of any in World Cup history. The official attendance was 2,459, but the actual figure is generally accepted to be around 300. Because of construction delays at Estadio Centenario, Uruguay's first match was not played until five days into the tournament. The first to be held at the Centenario, it was preceded by a ceremony in honour of the Uruguayan centenary celebrations. The Uruguayan team spent the four weeks preceding the match in a training camp, at which strict discipline was exercised. Goalkeeper Andrés Mazali was dropped from the squad for breaking a curfew to visit his wife. One hundred years to the day of the creation of Uruguay's first constitution, the hosts won a tight match against Peru 1–0. Spectators praised Peru's defense, and this turned out to be the only tournament match in which Uruguay scored only one goal. The result was viewed as a poor performance by the Uruguayan press, but lauded in Peru. Uruguay subsequently defeated Romania with ease, scoring four first half goals to win 4–0. The fourth group contained Belgium, Paraguay and The United States. The American team, which contained a significant number of new caps, were reputedly nicknamed "the shot-putters" by an unnamed source in the French contingent. They beat their first opponents, Belgium, 3–0. The ease of the victory was unexpected; Uruguayan newspaper Imparcial wrote that "the large score of the American victory has really surprised the experts". Belgian reports bemoaned the state of the pitch and refereeing decisions, claiming that the second goal was offside. The group's second match, played in windy conditions, witnessed the first tournament hat-trick, scored by Bert Patenaude of the United States against Paraguay. Until 10 November 2006, the first hat-trick that FIFA acknowledged had been scored by Guillermo Stábile of Argentina, two days after Patenaude; however, in 2006 FIFA announced that Patenaude's claim to being the first hat-trick scorer was valid, as a goal previously assigned to teammate Tom Florie was reattributed to Patenaude. With the United States having secured qualification, the final match in the group was a dead rubber. Paraguay beat Belgium by a 1–0 margin. The four group winners, Argentina, Yugoslavia, Uruguay and the United States, moved to the semi-finals. The two semi-final matches saw identical scores. The first semi-final was played between the US and Argentina on a rain-drenched pitch. The United States team, which featured six British-born players, lost midfielder Raphael Tracy after ten minutes to a broken leg as the match became violent. A Monti goal halfway through the first half gave Argentina a 1–0 half-time lead. In the second half, the strength of the United States team was overwhelmed by the pace of the Argentinian attacks, the match finishing 6–1 to Argentina. In the second semi-final there were shades of the 1924 Summer Olympics match between Yugoslavia and Uruguay. Here, though, Yugoslavia took a surprise lead through Vujadinović. Uruguay then took a 2–1 lead. Then shortly before half-time Yugoslavia had a goal disallowed by a controversial offside decision. The hosts scored three more in the second half to win 6–1, Pedro Cea completing a hat-trick. The now-traditional third place play-off was not established until 1934, so the format of the 1930 World Cup is unique in not distinguishing between the third and fourth placed teams. Occasional sources, notably a FIFA Bulletin from 1984, incorrectly imply that a third-place match occurred and was won 3–1 by Yugoslavia. Accounts differ as to whether a third-place match was originally scheduled. According to a 2009 book by Hyder Jawad, Yugoslavia refused to play a third-place match because they were upset with the refereeing in their semi-final against Uruguay. At the end of the championship, the captains of the United States team (Tom Florie) and Yugoslavia (Milutin Ivković) both received bronze medals. Yet a FIFA technical committee report on the 1986 World Cup included full retrospective rankings of all teams at all previous World Cup finals; this report ranked the United States third and Yugoslavia fourth, due to a better goal difference on otherwise identical records, a practice since continued by FIFA. In 2010, the son of Kosta Hadži, the chief of Yugoslav delegation at the 1930 World Cup and the vice-president of the Football Association of Yugoslavia at the time, claimed that Yugoslavia, as a team, has been awarded one bronze medal, which has been kept by Hadži himself and his family for the following 80 years. According to this source, Yugoslavia was placed third because of the semi-finals loss to the eventual champions, Uruguay. Because of a dispute, a different ball was used in each half, one chosen by each team. Argentina's ball (top) was used for the first half, and Uruguay's ball (bottom) was used for the second half. The resounding wins for Uruguay and Argentina in the semi-finals meant the final was a repeat of the matchup in the 1928 Olympic final, which Uruguay had won 2–1 after a replay. The final was played at the Estadio Centenario on 30 July. Feelings ran high around the La Plata Basin as the Argentine supporters crossed the river with the war cry Victoria o muerte ("victory or death"), dispelling any uncertainty as to whether the tournament had captured the imagination of the public. The ten boats earmarked to carry Argentine fans from Buenos Aires to Montevideo proved inadequate, and any number of assorted craft attempted the crossing. An estimated 10–15,000 Argentinians made the trip, but the port at Montevideo was so overwhelmed that many did not even make landfall before kick-off, let alone reach the stadium. At the stadium, supporters were searched for weapons. The gates were opened at eight o'clock, six hours before kick-off, and at noon the ground was full, the official attendance 93,000. A disagreement overshadowed the build-up to the match as the teams failed to agree on who should provide the match ball, forcing FIFA to intervene and decree that the Argentine team would provide the ball for the first half and the Uruguayans would provide their own for the second. Uruguay made one change from their semi-final line-up. Castro replaced Anselmo, who missed out due to illness. Monti played for Argentina despite receiving death threats on the eve of the match. The referee was Belgian John Langenus, who only agreed to officiate a few hours before the game, having sought assurances for his safety. One of his requests was for a boat to be ready at the harbour within one hour of the final whistle, in case he needed to make a quick escape. The hosts scored the opening goal through Pablo Dorado, a low shot from a position on the right. Argentina, displaying superior passing ability, responded strongly. Within eight minutes they were back on level terms; Carlos Peucelle received a Ferreira through-ball, beat his marker and equalised. Shortly before half-time leading tournament goalscorer Guillermo Stábile gave Argentina a 2–1 lead. Uruguay captain Nasazzi protested, maintaining that Stábile was offside, but to no avail. In the second half Uruguay gradually became ascendant. Shortly after Monti missed a chance to make the score 3–1, Uruguay attacked in numbers, and Pedro Cea scored an equaliser. Ten minutes later a goal by Santos Iriarte gave Uruguay the lead, and just before full-time Castro made it 4–2 to seal the win. Langenus ended the match a minute later, and Uruguay thus added the title World Cup winners to their mantle of Olympic champions. Jules Rimet presented the World Cup Trophy, which was later named for him, to the head of the Uruguayan Football Association, Raúl Jude. The following day was declared a national holiday in Uruguay; in the Argentinian capital, Buenos Aires, a mob threw stones at the Uruguayan consulate. Francisco Varallo (who played as a forward for Argentina) was the last player of the final to die, on 30 August 2010. France, Yugoslavia and the United States all played friendlies in South America following the competition. Brazil played France on 1 August, Yugoslavia on 10 August and the United States on 17 August, while Argentina hosted Yugoslavia on 3 August. Uruguay's aggregate goal difference of +12 over four games, at an average of +3 per match, remains the highest average goal difference per match of any World Cup champion, and the second highest of any World Cup Finals participant, after Hungary in 1954. With eight goals, Guillermo Stábile was the top scorer in the tournament. In total, 70 goals were scored by 36 players, with only one of them credited as an own goal. The last surviving player from Uruguay's World Cup-winning side was Ernesto Mascheroni, who died on 3 July 1984 at the age of 76. He was outlived by reserve defender Emilio Recoba who died on 12 September 1992 (aged 87), but did not play any matches in the tournament. However, many other players who participated in the tournament were still alive by this stage and the last surviving player from the tournament was Argentina's Francisco Varallo, who died on 30 August 2010 at the age of 100 – eighty years after the tournament. Lucien Laurent, the scorer of the first ever World Cup Goal was the last surviving Member of the France Squad and was invited in 1998 Final seeing France lifting its first ever World Cup win also as the only France member. He died in 2005 at the age of 97. ^ a b "History of FIFA – The first FIFA World Cup". FIFA. Retrieved 14 June 2014. ^ Hunt, Chris (2006). World Cup Stories: The History of the FIFA World Cup. Ware: Interact. p. 10. ISBN 978-0-9549819-2-1. ^ "Uruguay 1930". Fourfourtwo magazine. Archived from the original on 19 August 2007. Retrieved 20 June 2009. ^ a b "FIFA World Cup – Classic Moments from FIFA World Cup History". FIFA. Archived from the original on 26 April 2006. Retrieved 14 June 2009. ^ a b Vautrot, Michel (17 June 1998). "A historical link with the Franche-Comté". FIFA. Archived from the original on 8 June 2008. Retrieved 14 June 2009. ^ "1930 FIFA World Cup Uruguay". FIFA. Archived from the original on 2 February 2009. Retrieved 15 June 2009. ^ a b Lara, Miguel A. "Uruguay, allí nació la historia". Marca.com Archive (in Spanish). Marca.com. Archived from the original on 17 June 2009. Retrieved 14 June 2009. ^ a b "FIFA World Cup: Milestones, facts & figures. Statistical Kit 7" (PDF). FIFA. 26 March 2013. Archived from the original (PDF) on 21 May 2013. ^ a b c "World Cup History – Uruguay 1930". BBC Sport. BBC. 11 April 2002. Retrieved 14 June 2009. ^ Goldblatt, David (2007). The Ball is Round: A Global History of Football. London: Penguin. p. 248. ISBN 978-0-14-101582-8. ^ Dunning, Eric; Malcolm, Dominic (2003). Sport. Routledge. p. 46. ISBN 978-0-415-26292-7. ^ a b "25 datos sobre la Copa Mundial de la FIFA" (PDF). Retrieved 20 August 2011. ^ Glanville, Brian (2005). The Story of the World Cup. Faber. p. 17. ISBN 978-0-571-22944-4. ^ "History of the World Cup draw" (PDF). FIFA. Retrieved 14 June 2009. ^ Molinaro, John F. "Lucien Laurent: The World Cup's First Goal Scorer". CBC Sports. Canadian Broadcasting Corporation. Retrieved 14 June 2014. ^ Freddi, Cris (2006). Complete Book of the World Cup 2006. London: HarperCollins. p. 3. ISBN 0-00-722916-X. ^ Seddon, Peter (2005). The World Cup's Strangest Moments. London: Robson. p. 5. ISBN 978-1-86105-869-0. ^ Pulgar-Vidal Otálora, Jaime (24 February 2007). "Peru en El Mundial del 30". Jaimepulgarvidal.blogspot.com. Archived from the original on 29 June 2013. Retrieved 21 June 2013. ^ a b Almeida, Rony J. (2006). Where It All Began. Lulu. p. 91. ISBN 978-1-4116-7906-1. ^ "American Bert Patenaude credited with first hat trick in FIFA World Cup history". FIFA. Retrieved 14 June 2014. ^ "The first World Cup hat trick". Rec.Sport.Soccer Statistics Foundation (RSSSF). Archived from the original on 4 November 2009. Retrieved 3 December 2009. ^ Lisi, Clemente Angelo (2007). A history of the World Cup: 1930–2006. Lanham, Maryland: Scarecrow Press. pp. 16–17. ISBN 0-8108-5905-X. Retrieved 26 April 2011. ^ a b c Crouch, p. 11. ^ "World Cup 1930 finals". Rec.Sport.Soccer Statistics Foundation (RSSSF). Archived from the original on 2 June 2009. Retrieved 14 June 2009. ^ a b "Permanent Table" (PDF). FIFA World Cup México '86 – Technical Report. 1986. p. 230. Retrieved 11 July 2010. ^ "Final Tournament Standings". 1930 FIFA World Cup Uruguay. FIFA. Retrieved 14 June 2014. ^ Медаља из дома Хаџијевих сведочи да смо били трећи на Мундијалу (in Serbian). Politika. Archived from the original on 3 May 2010. Retrieved 1 May 2010. ^ "Još uvek sjaji bronza iz Montevidea" (in Serbian). Blic. Archived from the original on 23 June 2010. Retrieved 25 May 2010. ^ a b "FIFA World Cup Origin" (PDF). FIFA. Archived from the original (PDF) on 15 June 2010. Retrieved 17 November 2009. ^ a b c Freddi, p. 12. ^ "El gol está de luto". Olé (in Spanish). 30 August 2010. Retrieved 30 August 2010. ^ "Seleção Brasileira (Brazilian National Team) 1923–1932". RSSSF Brazil. Archived from the original on 14 August 2007. Retrieved 20 June 2009. ^ "Argentina national Team archive". RSSSF. Archived from the original on 3 June 2009. Retrieved 14 June 2009. ^ a b c This is one of several goals for which the statistical details are disputed. The goalscorers and timings used here are those of FIFA, the official record. Some other sources, such as RSSSF, state a different scorer, timing, or both. See "World Cup 1930 finals". Rec.Sport.Soccer Statistics Foundation (RSSSF). Retrieved 15 August 2010. ^ a b c d e This is one of several goals for which the statistical details are disputed. The goalscorers and timings used here are those of FIFA, the official record. Some other sources, such as RSSSF, state a different scorer, timing, or both. See "World Cup 1930 finals". Rec.Sport.Soccer Statistics Foundation (RSSSF). Retrieved 15 August 2010. ^ a b c d This is one of several goals for which the statistical details are disputed. The goalscorers and timings used here are those of FIFA, the official record. Some other sources, such as RSSSF, state a different scorer, timing, or both. See "World Cup 1930 finals". Rec.Sport.Soccer Statistics Foundation (RSSSF). Retrieved 15 August 2010. ^ a b This is one of several goals for which the statistical details are disputed. The goalscorers and timings used here are those of FIFA, the official record. Some other sources, such as RSSSF, state a different scorer and/or timing. See "World Cup 1930 finals". RSSSF. Archived from the original on 3 December 2008. Retrieved 1 December 2008. .
^ "Francisco Varallo: Last surviving player from first World Cup final dies aged 100". Dailymail.co.uk. 31 August 2010. Retrieved 29 June 2014. Goldblatt, David (2008). The Ball Is Round: A Global History of Soccer. Penguin. ISBN 978-1-59448-296-0. Retrieved 30 August 2010. Lisi, Clemente Angelo (2007). A history of the World Cup: 1930–2006. Lanham, Maryland: Scarecrow Press. ISBN 0-8108-5905-X. Retrieved 26 April 2011.